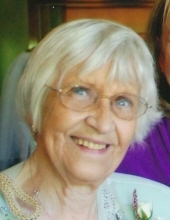 Peoria- Evelyn “Ev” M. Johnson, age 94, of Peoria, passed away at 12:15 AM on Friday, April 12, 2019 at OSF Richard L. Owens Hospice Home. She was born on February 25, 1925 in Port Bryon, IL to Harry L. and Maude Smith Mose. Ev married Everett L. Johnson August 3, 1946 in Moline. He preceded her in death after 53 years of marriage. Survivors include her two sons: Larry (Sue) Johnson of Crystal Lake and Jerry Johnson of Peoria; daughter Teresa (Pat) O’Brien of Peoria; eight grandchildren and 11 great-grandchildren; and one sister Jean Taylor of Silvis. Ev was preceded in death by her parents, husband Everett and one brother Glen. She retired from J.C. Penny in 1988. Ev was a member of St. Vincent de Paul Catholic Church, a member and past president of Peoria Emblem Club #121 and a member of the Knights of Columbus Auxiliary. Faith, family and friendships were instrumental in her life. Nothing gave her more pleasure than spending time with her grandchildren and great-grandchildren. Ev’s optimistic spirit and positive attitude has been an inspiration to all who knew her. Visitation will be held on Tuesday, April 16, 2019 from 9:00 AM until time of Mass of Christian Burial at 10:00 AM at St. Vincent de Paul Catholic Church. Father Stephen Willard will officiate and cremation rites will be accorded following services. Entombment of ashes will take place at Resurrection Cemetery at a later date. Memorials in Ev’s memory may be made to the Peoria Emblem Club #121 Scholarship Fund, P.O. Box 1162, Peoria, IL 61615 or St. Vincent de Paul Endowment Fund, 6001 N. University, Peoria, IL 61614, or the PKD Foundation, 1001 E. 101st Terrace, Suite 220, Kansas City, MO 64131. Friends and family may sign the online guestbook or send private condolences by logging on www.wrightandsalmon.com. To send flowers or a remembrance gift to the family of Evelyn "Ev" Johnson, please visit our Tribute Store. "Email Address" would like to share the life celebration of Evelyn "Ev" Johnson. Click on the "link" to go to share a favorite memory or leave a condolence message for the family.